It may be that I'm a spinner (my average cadence on a rude is usually in the 85-95 range) & I rarely get out of the saddle - I didn't much anyway but several thousand miles of tandem riding in the last few years means I do it even less. For the last 12 months I have been riding a heavier bike (around 12kg in running order compared to around 10kg previously) the bike is also shod, mostly, with 38mm Vittoria Voyager Hypers (alternatives, but much less used, are 40mm WTB Nanos or 38mm Schwalbe Snow Studs) compared to 28mm Conti GPS previously. My rides get uploaded to Strava as a log of where I've been but I've been pleasantly surprised to find that it is regularly telling me, after the event, that I've set a personal record on some stretch or another. My annual average speed still seems pretty consistent (& probably affected more by the inclusion in my log of rides with kids or led rides where the average speed can be 6-8mph, occasionally slower). What I don't get is the buzz of narrow hard tyres on the road that can sometimes be mistaken for speed. And some, many possibly, roads can be ridden much faster as you don't need to weave nearly as much around the potholes or dodge the loose stones. There is a hill near us that I am consistently riding down at least 5mph faster as I no longer have to worry about shaking fillings loose or getting a pinch flat because I've not noticed that one stone washed out onto the road that is just that little bit bigger than the rest of its companions. Brucey wrote: It is very probable that this is also associated with much higher hysteresis losses in the tyre, i.e. greater rolling resistance. There is also some slippage (always) between the rear wheel tread and the road. Both these things will never be seen on a typical tyre test because the tyres are simply rolled around a drum with no torque other than the tiny torque of pure rolling being transmitted. In other words the fact that the rear wheel is being used to drive the bike along is completely ignored in such tests; the tests only represent what is going on at the front wheel. I think that fatter tyres can be very much more lossy under high torque conditions, i.e. whenever you are climbing, or whenever you are laying down a large amount of power, or you have a high peak force in the pedal stroke. On the other hand, the tyre is only wound up in this way (and unwound with some loss of energy to hysteresis) twice per crank revolution, whereas the deformation at the contact patch is constantly renewed as the tyre rolls. A while ago, Contador in his Saxo/Tinkoff years tried a strategy of swapping bicycles at the bottom of major climbs. The climbing bicycle had among other optimisations an extremely high tyre pressure, supposedly in the 200 PSI range. I thought that was to reduce the effect you describe and the periodic extreme vertical deformation at the contact patch in time with the lunging pedal stroke while standing. Didn’t stop Froome beating him! The tyre makes a lot of noise on the downstroke while climbing out of the saddle, but I don’t know how reliably that indicates hysteretic losses. I thought it was just the tyre scuffing the ground that, while lossy, is probably not as lossy as it sounds. I remain convinced that what you feel while cycling is almost entirely irrelevant to performance and the only way to understand these phenomena is through physics, albeit imaginatively applied. The idea that you can feel any difference in rolling resistance between a 23 mm tyre and a 25 mm tyre is far-fetched. You cannot even measure these tiny differences in the noisy real world with simple methods. That’s why we need lab tests of rolling resistance. Even the comfort difference between 23 mm and 25 mm tyres at appropriate pressures is in the just-noticeable range and dwarfed by imagined differences. 1. Jan Heine and Bicycle Quarterly think that roll-down tests are much more realistic than tests on drums, and base a lot of their ideas on these tests. But... they're not pedaling, so if Brucey is right, these are still not very realistic tests. 2. Why not ride with a really fat tire at the back and a thin one at the front, and then switch them over and see what happens? I know that the front and rear tyres carry different amounts of weight, and the aerodynamics at the front and rear may be different, but surely if we are talking about a big difference then this would be noticeable? 3. Regardless of the losses from hysteresis, having a "spongy" feel in the drivetrain may not be conducive to efficient pedaling. Imagine having a springy, stretchy chain. A big soft tyre could create a spongy drivetrain, as it is wound up and unwound with each pedal stroke. putting some numbers to this; regarding the traction forces supplied to the rear wheel; at 10m/s (just under 20mph) if you produce 150W then the average traction force is 15N. Which doesn't sound like much. c) the force is also proportional to the power output. i.e. that are x16 higher, or 240N peak instead of 15N average. If a rider puts out a full sprint up a steeper hill, peak loads are likely to be double again. Even steady state riding at 150W, 5m/s will generate 60N peak loads. I don't think that these loads can be transmitted through the tyre without loss and without consequence. Jan has also done tests using a road with a "rumble strip" to give a comparison between smooth & rough. Here is what he wrote in June 2016 & here in August 2016. Leeflatz wrote: Is there honestly that much difference between 25mm and 23mm tyres? Been using 23s for years in all weather's, even on tracks and canal bank, no problem. On these tracks you can manage as long as you don't sit on the bike like a sack of spuds. Does 2 mm make that much difference? Bemused by all the debate I keep coming across. In short and circumventing all the rather dull physics, no not much difference but some. Bigger tyres are heavier and have more rolling resistance (in most real world scenarios) but tend to provide a better cushion as they have more air in at a lower pressure. If you want a comfy ride, try 28mm tyres and you WILL get it; if you want to go faster try 23mm and you WILL go faster. Can someone please close this thread now before Stephen Hawkins gets involved? Samuel D wrote: I remain convinced that what you feel while cycling is almost entirely irrelevant to performance and the only way to understand these phenomena is through physics, albeit imaginatively applied. The idea that you can feel any difference in rolling resistance between a 23 mm tyre and a 25 mm tyre is far-fetched. You cannot even measure these tiny differences in the noisy real world with simple methods. That’s why we need lab tests of rolling resistance. Even the comfort difference between 23 mm and 25 mm tyres at appropriate pressures is in the just-noticeable range and dwarfed by imagined differences. mullinsm wrote: If you want a comfy ride, try 28mm tyres and you WILL get it; if you want to go faster try 23mm and you WILL go faster. An appearance by the great man really would make my year! I would not say that what you feel is irrelevant to performance, but I would say that things can be counter-intuative. There is absolutely no point debating based on opinion, "common sense" and intuition because these are all irrelevant. All that matters is hard data. Has anyone here got actual data from measurements in the real world? Or references to real data measured by others? I'm sure the race teams will have but obviously they don't publish this. I can say for certain that measuring rolling resistance in the real word is not easy (I have tried), it has a very small effect compare to gradients or wind. The only method I know of which is reputed to be accurate is the "Chung" method which requires a power meter (which I don't have). RickH wrote: It may be that I'm a spinner (my average cadence on a rude is usually in the 85-95 range) & I rarely get out of the saddle - I didn't much anyway but several thousand miles of tandem riding in the last few years means I do it even less. As you rightly say more comfort,less issues riding bad road surfaces and no road buzz,with my average speeds within 1mph of the lighter bike shod with narrower HP tyres. some pro teams pay what they like to have the exact equipment they like best. Most however are not as well funded as that and have to take sponsorship deals wherever they find them. Often this includes riding equipment that is the choice of the sponsor, not of the team. Without a bit more information the fact that some team (that might have no riders capable of winning a TT) runs certain TT wheels might tell you more about their sponsorship deal than anything else. FWIW I think that team Sky have enough cash to ride what they like, and what they like is rim brakes and all kinds of things that other teams don't use, because other teams are being paid to ride something else. My take on it is that 25mm tyres on the right rims don't put you an aero disadvantage, but if you are using ~19mm external width rims then they probably do, and if you go to 28mm tyres it is worse again. Scunnered wrote: ...The only method I know of which is reputed to be accurate is the "Chung" method which requires a power meter (which I don't have). A method which looks like it would be a practical way to get accurate rolling resistance values without expensive equipment is to pull a wheel along by a force sensor. This is nice and easy because you can read the force directly, rather than having to calculate it from power output. I note that they conducted all but the initial tests indoors in the "IM room" which had a linoleum floor, in order to avoid the effects of gradient and wind, and even so "No conclusions about the relationship of various parameters such as tire pressure or vertical load can be established from the tests conducted with this method so far". For my own attempts I made 35 pairs of measurements outdoors on real roads and solved using my modified version of the Grappe and Candau equations, which resulted in the following chart. 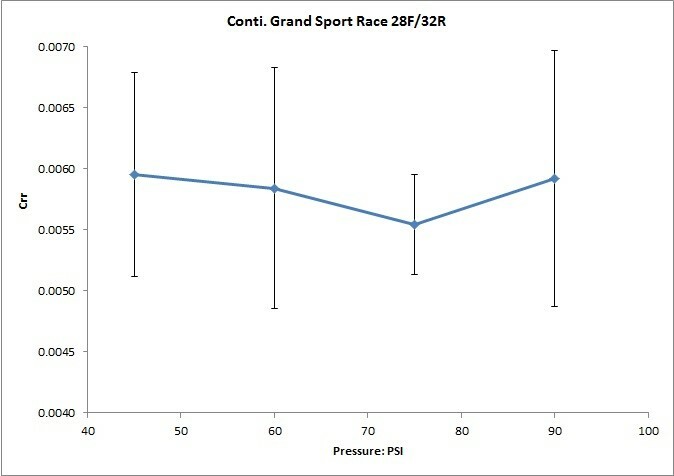 Basically, any reasonable pressure made little detectable difference, the dip at 75psi is not statistically significant. It is NOT easy!